The house(s) are likely to be mid 15th century given the crown post roofs. 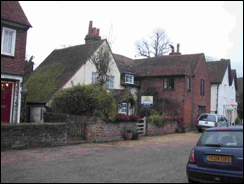 This house appears on the John Holmes Map of 1709 now in the care of Surrey History Centre.. It can be seen below as the second house outside the lychgate of St Peter’s, the first house is the now demolished house of which No. 1 Church Cottages formed part. John Tickner, agricultural labourer and his wife Elizabeth plus James Daw brewer. John Tickner, agricultural labourer and his wife Elizabeth plus David Harwood plumber and glazier and Thomas Sherlock cordwainer, both visitors. John Tickner, labourer, his wife Elizabeth and James Ottaway groom. Joseph Bullen, labourer in paper mill, his wife Ellen and their son James plus Elizabeth Jelley laundress. William Webber, his wife and daughter are still living in the street. It is likely that the cottages were known as Whitburn Cottages in 1919. The Woking News and Mail Directory of that3 year showed the occupants as James Smith, W Shearing, J Elsley and F Cole. There would appear to have been four occupants up to 1932. it is possible that Messrs Smith and Shearing were in what is now Wey Cottage and Messrs Elsley and Cole in Lea Cottage. Were the two cottages further divided? Michael Allbrook, a previous owner of Wey Cottage, has supplied the following details of owners between 1900 and 1975. It would appear from these that the cottage was tenanted from time to time.